I've now switched to a Java package which runs under Ubuntu. Details on the mbed site. The next step should be to do some timings, but I won't be able to run at full speed until the chaps at mbed have finished porting one of the libraries I need to the new beta mbed LPC11U24. I just re-discovered Let's Make Robots - a site for robot builders to show off their work, exchange ideas and learn from others. It looks like a great resource with a friendly community. If you're a robot-builder, take a few minutes to register and post details of your robotic creations. 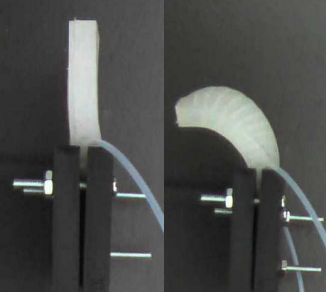 Soft robots keep popping up (or slithering along) all over the place. I'm beginning to think I ought to take a closer look at the technology in my copious free time. I wonder how well a combined crawler/gripper would function underwater. While working on the mbed logic analyser, I realised I had run out of USB ports on my workstation. A quick search on Amazon suggested this D-Link DUB-H7 7-port USB 2.0 Hub . I ordered one and it arrived today. Nothing earthshaking, but it works well, looks nice and is reasonably priced. Recommended. My black Friday Pololu order arrived this morning. I'm delighted with the purchase, and one item in particular has blown me away. 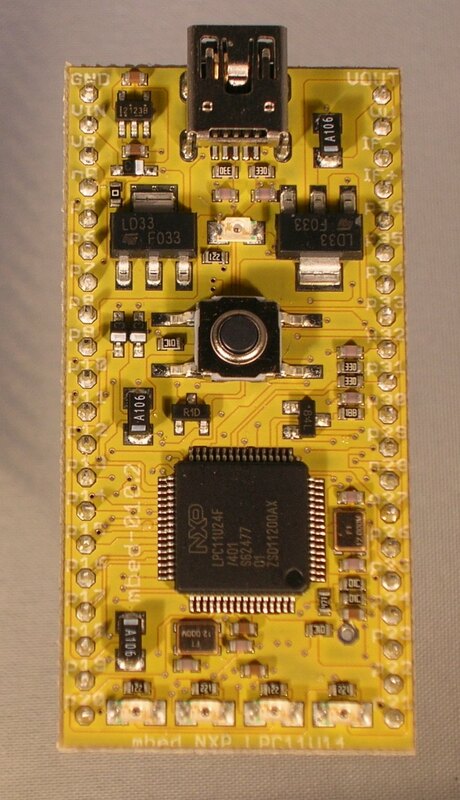 It's a MiniMU-9, which combines a triple-axis gyro, a triple-axis accelerometer and a triple-axis magnetometer. In other words, it measures all the data you need to work out the position and orientation of a mobile robot. And it's tiny. To give you a feeling of its size, the connector holes in the image are 0.1" apart, and it weighs just under a gram. Seriously, the Raspberry Pi (described in the Register article linked to above) is well-suited to the job of managing an autonomous blimp. It's true that the gumstix is even smaller than the Pi, and available this month rather than next; but it costs a lot more. Meanwhile I have projects stacked up that will keep me occupied for the foreseeable future. I have more work to do on my beta mbed project, and I need to post more Python I2C code for the Beagleboard. Meanwhile TrackBot is still waiting for a working radio link. Christmas is going to be busy this year. I'm making steady progress on my Logic Analyser project for the new beta version LPC11U24 mbed. So far everything has worked as it should, although one or two libraries are still being ported to the new device. I can already send the state of an 8-bit wide set of mbed inouts to the PC over a USB HID connection. I have now idea how fast the final version will be, but it should be able to analyse fast (400kHz) I2C and some SPI interactions in real time. Hendrik Lipka (another mbed user) suggested that I might adapt the open-source SUMP client so that it can capture, analyse and display data on the PC. That's an exciting idea which I will certainly follow up. I'm having great fun with the new mbed. Just working my way through the examples so far, and everything is working well. The photo show the mbed pretending to be a USB mouse. I'm looking forward to getting stuck into my logic analyser project; once that is finished I may hook the mbed up to my pseudo-microwriter and turn it into a USB device. I mentioned a few days ago that a new mbed was on its way. It's still in beta, but I was lucky enough to be selected for the beta program and I am starting work on my project. First impressions are very positive: the instructions on the mbed site are very clear. It took about two minutes to use the cloud-based compiler to create the obligatory led blinking program and then drag the binary file over to the mbed. Now to work through the examples and test it out as a USB device. Like many US retailers, Pololu are offering massive Black Friday discounts on a range of their robotics products. The last item looks perfect for an autonomous vehicle/aircraft navigation system. There are also flat discounts available, depending on the size of your order; these can be combined with the individual product discounts. I just saved $150 on a $350 order. One thing to take into account: if you're buying from outside the USA you will have to pay local taxes and a processing fee to the shipping agent when the goods arrive. The offer is time-limited, and will expire at 11:59 PM PST on Monday, November 28 (7:59 AM GMT on Tuesday, November 29). Yesterday Google hosted a qualifying tournament for the Bay Area First Lego League (FLL) at their Mountain View Headquarters. Imagine the excitement of the 9 to14 year-olds as they arrived at Google headquarters. They will remember the event for the rest of their lives, and who knows what they will achieve in the years to come. At a time when news is full of economic gloom, it's great to see the excitement and creativity of the young, who are living at the start of a golden age of maker technology. GreenArrays have announced the GA144, a low-energy processor with 144 cores. It's not cheap, as the minimum order is for 10 $20 chips, and the development board is $450 dollars, but it's of great interest to me; next year I will need some real processing power for a neural-network robot I am working on, and this looks as if it would be ideal. Robotics enthusiasts will probably be familiar with the Parallax propeller, an inexpensive multi-cored processor that is desgined for hobbyist use. The propeller is an affordable introduction to parallel processing, but the GA144 offers a couple of orders of magnitude more processing power and is very energy-efficient. The chairman of GreenArrays is Chuck Moore, the inventor of Forth. The GA144 supports arrayForth, a powerful language for parallel computing. Windows for Devices just published an article suggesting that a recently launched product from Embest and Farnell was taking on the BeagleBoard xM. The DM3730-EVK from Farnell is based on a TI DM3730 chip - a Corterx A8 with DSP capability. It comes with 512Mb of flash and 512Mb of RAM; the kit also includes a 4.3" screen. Out of the box it boots linux or WinCE. It's priced at £353.00 + VAT. The BeagleBoard has 512 Mb of RAM and the same TI chip; LED screens are separately available, as is WinCE. It costs £124.80 + VAT. A touch screen might add another £120 to that. However, there's a more fundamental difference between the products. The DM3730-EVK is clearly aimed at the commercial market. It seems to be a stable design which you could sensibly use as the basis for pilot (small-scale) production of a commercial product. 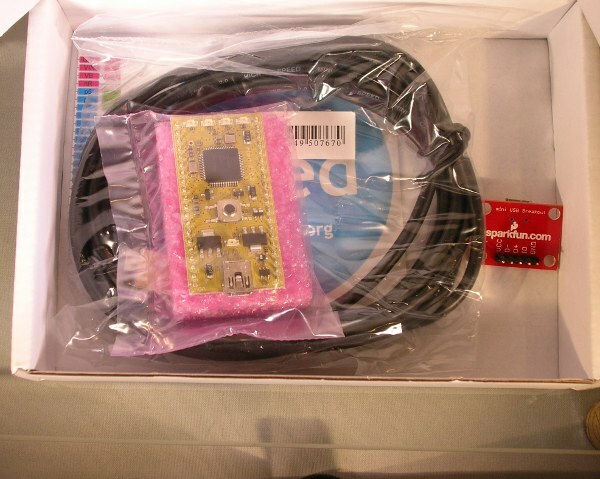 The Beagleboard explicitly warns that it's not intended for production use, largely because the team reserve the right to change the design whenever they come up with improvements. Great for prototyping or proof-of-concept, and inexpensive enough for anyone who wants to try out a new idea. One of the members of Premier Farnell's element14 has just posted about a soft robot which uses hydraulics to move around. (The post suggests there are chemical reactions involved, but that doesn't seem to be the case). The picture shows an actuator like those used to move the robot. If that's not scary enough, you can watch a video. I find the snail-like creature rather scary; it wouldn't be out of place in Doctor Who. Luckily it moves so slowly that escape would be fairly simple, unless you're surrounded by the beasts! The original poster cited a paper on the Distributed Robotics Laboratory Wiki. You'll find many other fascinating robotics projects described there. It's a great place to look for inspiration if you want to start a robotics project that would really stand out. 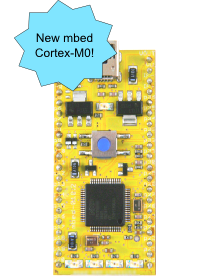 Last year marked the debut of the mbed - an ARM-based System-on-a-chip from NXP in a compact 40-pin DIL format. I was lucky enough to be selected to do a road-test for Farnell's element14. The mbed is an amazing product. One of its great strengths is the large support library which includes code developed by the mbed team and by its users. 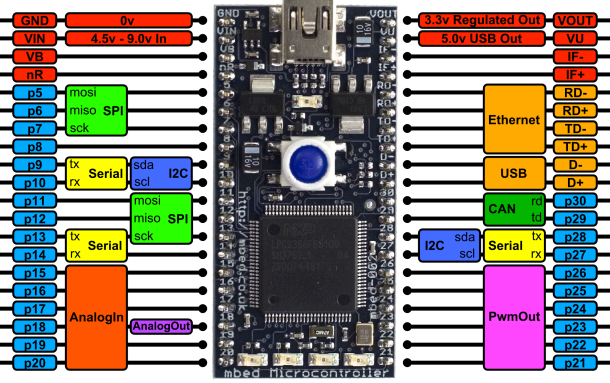 With I2C, SPI and Serial suport, and a full set of GPIO pins, it's easy to interface to external devices, and the web-based compiler means that you can program the device within 5 minutes of opening the box. Now a second mbed is in beta-test. Based on the NXP LPC11U24, it is designed for prototyping USB devices, battery powered applications, and 32-bit ARM Cortex-M0 designs. I'm hoping to get my hands on one soon and will report in due course. The original mbed is still selling well, and is available from Farnell for just under £40 + VAT. People have been speculating about what young users will do with something like Raspberry Pi, the $25 dollar computer. Here's a clue from TED. really warmed to the idea of Raspberry Pi. They're optimistic that it would encourage their children to program, rather than just play games and hack visit social networking sites. I can guess what the young may be getting from Santa this year. This is alpha code; the API will change; the code may not work and/or may do bad things. Use it at your own risk. If you aren't familiar with Git/GitHub, there is good reference material here. 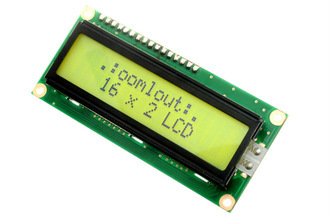 Robot Electronics offer a very nice 20x4 LCD display with I2C/Serial interface for £19.99 + VAT. I've hooked it up to an Arduino; it's easy to drive and looks very professional. I stumbled across Robot Electronics while searching for LCD suppliers. It turns out that they are the on-line trading arm of Devantech, whose Ultrasonic Rangers are widely used in Robotics Projects. Their full range of products is much wider than that, and their on-line shop is well worth a visit. We're seeing a great and welcome upsurge of interest in introducing school children to programming, rather than just teaching them how to use Powerpoint, Word and Excel. The software has been developed under Windows, which is appropriate for the intended audience. My study is normally a windows-free zone; I could have installed Wine (the software that allows you to run a lot of Windows Software under Linux), but it seemed simpler to fire up a VirtualBox VM running Windows XP. Once I'd done so, it took a minute or so to download the 72Mbyte package, and a couple of minutes to write a simple led flashing program. I have to confess I didn't read the documentation, but the interface is intuitive enough that I didn't need to. There are plenty of examples on the website, and a demo video on the blog. Minibloq is fun, and I intend to play with it some more over the next few days. 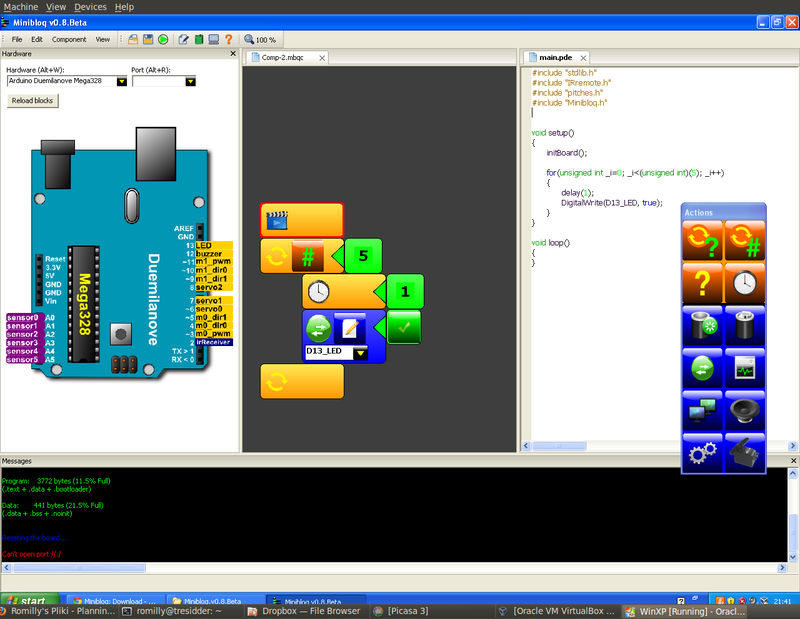 One of the features I like best is that you can ask to see the code that's being generated as you develop your program. The visual interface is very accessible, but when you're ready Minibloq will help you transition painlessly to text-based programming. Congratulations to the Minbloq team. Great work. We'll hear more about this software. I've just been enjoying A Curriculum of Toys - an article in Make Magazine by Saul Griffith. (Thanks to +Limor Fried for the link). Griffith examines the ways in which children can learn from toys. He lists the skills that great toys can help to develop, and looks at activities which foster those skills. Play is a core part of learning, and good toys promote good play. On Sunday mornings, years ago, my daughter Alex and I would steal quietly downstairs to listen to music and build things. We started when she was two, building things with sticklebricks, then moved on to duplo and LEGO. She and I are convinced that those Sunday mornings played a part in fostering her Maker skills. If you want to see what she's made with them, take a look at Let's Get Prehistoric. Some people dismiss play; they consider it at best a break, at worst a waste of time. Saul Griffith takes the opposite view. Play helps us, as children and as adults, to develop, to interact with others, to find out who we are and to express our natural creativity. Playing with good toys is a great educator. Saul Griffith's article spells that out in concrete, practical terms. Update: The first batch of stickers sold out in 24 hours! More are on their way, and you can pre-order the stickers (but not the Pi!) from the website. A lot of people are getting very excited about the imminent launch of the Raspberry Pi. It's an ultra-low cost Linux-capable board based on an ARM11 core, and it's due to go on sale in December. If you want a quick overview of the Pi and what it can do, this video on the foundation website is a good place to start. The Raspberry Pi foundation expects strong early demand from hobbyists, but the longer-term aim is to attract new users at school level. Since the Pi is to sell for about £20-£25 that looks realistic. You can't pre-order the Pi, and should beware of sites offering the Pi: they are trying to part you from your money. 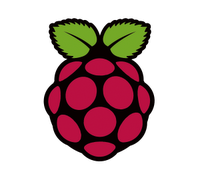 You can help to test out the new on-line shop and contribute to this very worthwhile project by purchasing a Raspberry Pi sticker. You'll end up paying a little over £3, most of which will go to support the foundation. If you want to use an ARM-based Linux board for robotics or test gear applications you are spoilt for choice at the moment. There's the Beagleboard, the mbed, the LPCxpresso, and the gumstix range. Soon there will be the BeagleBone and Rapsberry Pi. While their markets overlap a little, each board has its own unique advantages. Once I've got my hands on the BeagleBone and Pi I will attempt a feature-based comparison and post the results. While you're waiting, do register at the Raspberry Pi site and buy a sticker! 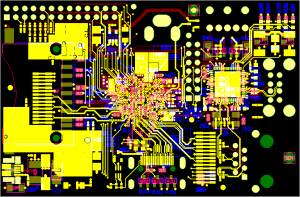 I want to revise the design of my I2C-based LCD board. 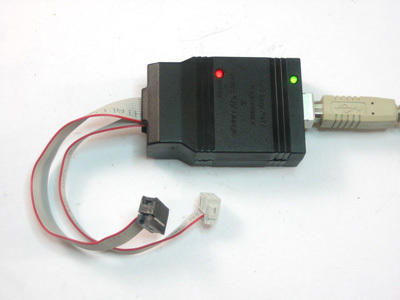 The old design works, but it's not reliable and it puts a lot of traffic on the I2C bus. I'd prefer something that created less traffic and placed fewer demands on the host. I2C is a great protocol for connecting sensors to micro-computers, but you can also use it to link two computers together. The solution that I'm looking at will use an Atmel 8-bit AVR processor to drive the LCD and act as an IC2 slave. That way the host computer needs to send just two bytes down the wire to write a character. The current design sends three or four times that many. 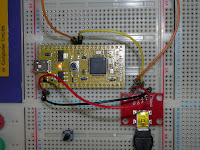 Get the BeagleBoard talking to an Arduino over I2C with BB as master and Arduino as slave. Connect the Arduino to the LCD. 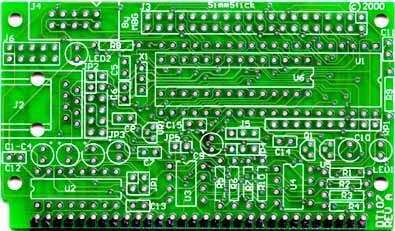 Put an ATMega8 in a DT104 board from Dontronics. I have several of each spare. 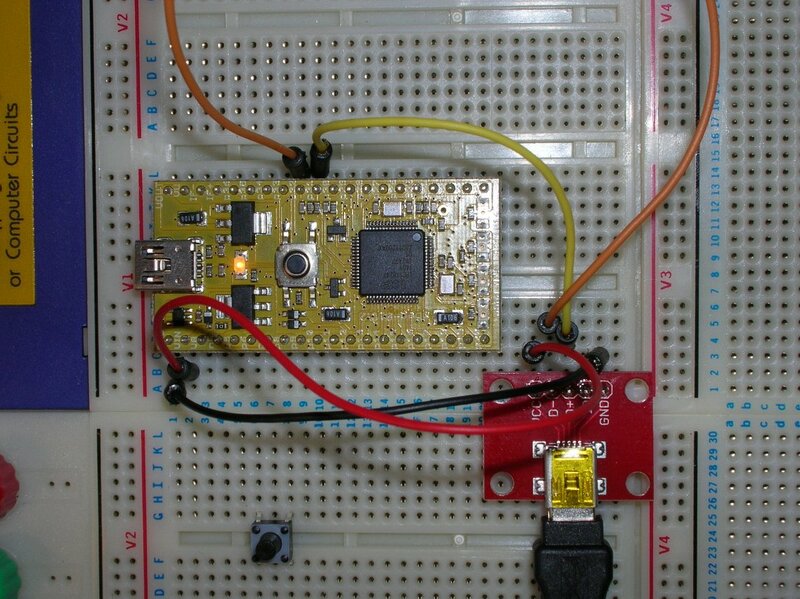 Program an arduino bootloader into the ATMega8. Upload the I2C-LCD sketch to the ATMega8. Build a simple stripboard base for the LCD and the motherboard and connect them up. 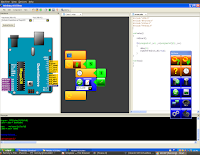 There's a handy I2C slave sketch among the Arduino examples, and a good tutorial showing how to connect two Arduinos on the main website. I've programmed the Arduino slave to sit on I2C address 4. It's safe to connect the Arduino and the BB because tincantools' Trainer-xM board shifts the Beagle's 1.8v I2C signals to the 5v required by the Arduino and vice versa. on the Beagleboard, it sends a byte value of 67 on bus 2 to the device with I2C address 4 and the character 'C' (ascii decimal 67) is received by the Arduino. I expect that Step 2 will be the most time-consuming; patching together an Arduino an LDC is fiddly, but I've done it before and there are very clear instructions from Oomlout for the LCD that they supply. Once that's done the rest should be fairly straightforward. Yesterday was frustrating but instructive. I started testing the radio link to TrackBot. At a minimum I want to create a dead man's handle to prevent the robot from careering into a wall. Some control over direction and speed would also be useful. I'd set up an arrangement like this a few year back using a LEGO base and an AVR conrtoller. I kept the hardware but I was a bit lazy about project notes in those days. However, I knew that I'd been able to transmit commands from a Laptop to the AVR and I still have the receiver, the trnasmitter, and the hand-wired RSR232 cable and connector that I used to send sigmals from the Laptop. I spent hours trying to get the arrangement working with Trackbot. I could detect when a character was being transmitted, but it wasn't being sent correctly. Usually this is a baud rate, frame length or parity issue, but not this time. I checked and rechecked code and comms settings, but to no avail. Time to try the Bus Pirate. The Bus Pirate is an open-source troubleshooting tool which you can use to snoop or send messages in various protocols - I2C, SPI and Serial comms among others. I got mine from Proto-Pic along with its cables. I linked it up to my receiver and confirmed thad data was not being received as expected. Each character was reported as having a framing error. I checked the transmitter where I saw the same problem. Eventually I gave up, packed up for the evening, and had supper. Later that evening I had a flash of inspiration. What if the signal was inverted? The Bus Pirate has an option to invert a serial comms signal; as soon as I turned it on, the framing errors disappeared and the Bus Pirate correctly reported the characters I was sending. 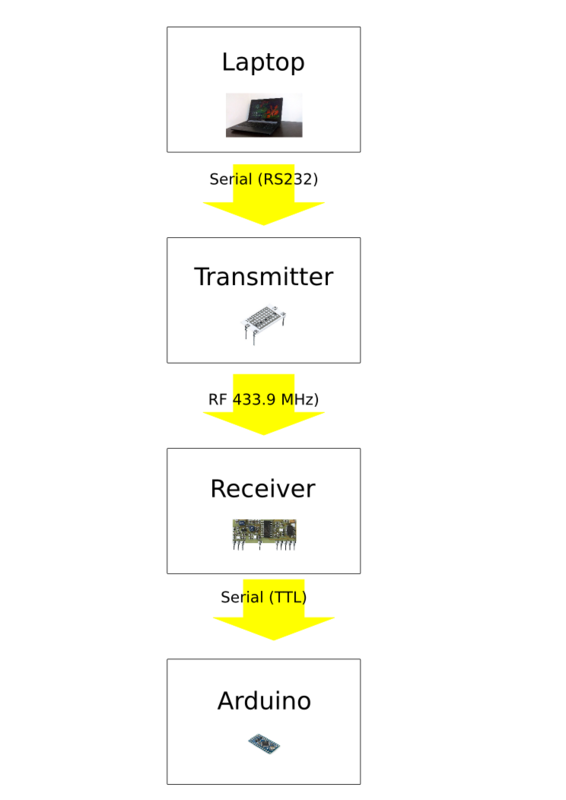 A quick Google search, and I remembered what I had found out years ago: RS32 comms is active-low, but TTL comms is active-high. In other words, a 0-bit going down an RS232 cable is represented by +12v, and a 1-bit by -12V. TTL is not inverted; a TTL 0-bit is 0v but a 1-bit is +5V. Since one end of the link uses RS232 and the other uses TTL, every character gets garbled. Last time round I fixed this by software. This time round I can simplify the transmitter circuitry and use an FTDI USB to TTL comms cable for the transmitter. But not today - I am waiting for a replacement soldering iron stand. So it's time to do some more I2C development on the BeagleBoard. I've taken a break from the beagleboard and have been working on TrackBot - a tracked robotics prototyping platform. The first iteration is complete; TrackBot now moves under program control. It's running a simple test program which turns left, turns right, then moves forward and back, stops, turns a led on and then repeats the cycle. More ambitious behaviour can wait until I have a proximity sensor working; strip-board is fragile and I don't want TrackBot to break itself by running into furniture or a wall. TrackBot is built from a Pololu RP5 base (now sadly discontinued by Pololu, but still available from Active Robots). The base is controlled by a Solarbotics L298 compact motor driver; that in turn is controlled by an Arduino Pro Mini 328 (5v/16MHz). The next iteration will be to link up radio control. I've already mounted an old 433.9 MHz radio receiver, but it's not yet connected to the Arduino. After that I'll add proximity sensing (using IR and Ultrasonics), and a compass. That's probably about as far as I want to go with the Arduino Pro; the Arduino platform is great for quick, simple prototyping but not so well suited to complex, concurrent processing. 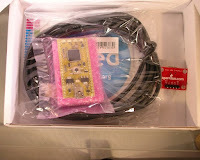 The whole project is a first step towards B4 - the BeagleBoard based 'Bot. That will be based on the BeagleBoard xM or the recently-announced BeagleBone. It will probably contain an AVR as well, running some form of RTOS.